I guess this is the week of trying places I've long driven by (see previous post). Panes Bread Cafe has been a Lakeview fixture since 1994. However it's not a place I tried until 2016. I'd always wondered about the place as it gets great online reviews. However I was never compelled enough to stop until I saw one if it's sandwiches listed as one of the city's best on one of the social media sites that like lists. Panes feels like a place born in the 90's. It's got a somewhat Parisian feel to it as well with it's decorations and also the menu. Aside from the sandwiches they also do salads and baked goods. I tried a sample of a peanut butter brownie and it was almost good enough to order one however I rarely order dessert. I also rarely order salads but one day I wanted one and didn't want to go far thus their tortilla chicken salad seemed to be in order. It's just lettuce with grilled chicken paired with crispy tortilla strips, some veggies, and cheese served with honey mustard on the side. Well made. Now back to that sandwich. I saw some list and of course had been to and tried most every sandwich on said list with the exception of one. 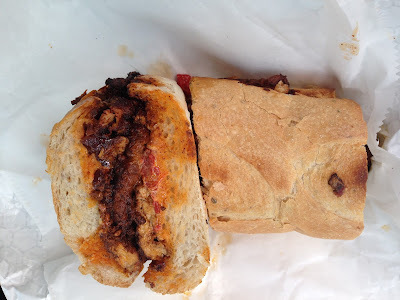 The Oaxacan Pork Sandwich from Panes was new to me. Some searching online revealed it has it's fans and I wanted to see if I could become one. Well I probably wont be a die hard like others but I thought it was a decent enough sandwich. I also thought something was missing but couldn't quite pinpoint what that was. Strips of pork and onion were marinated in a red chile sauce and the bread held it all together but maybe some pickled red onions or something would've given it more depth. Either way I found Panes to be a nice neighborhood place. This is a gorgeous place, and I won't soon forget it. Attended an event here sponsored by the company. The reception hour was held in one of the rooms next to the event space NYC. I loved their buttery mashed sweet potato.